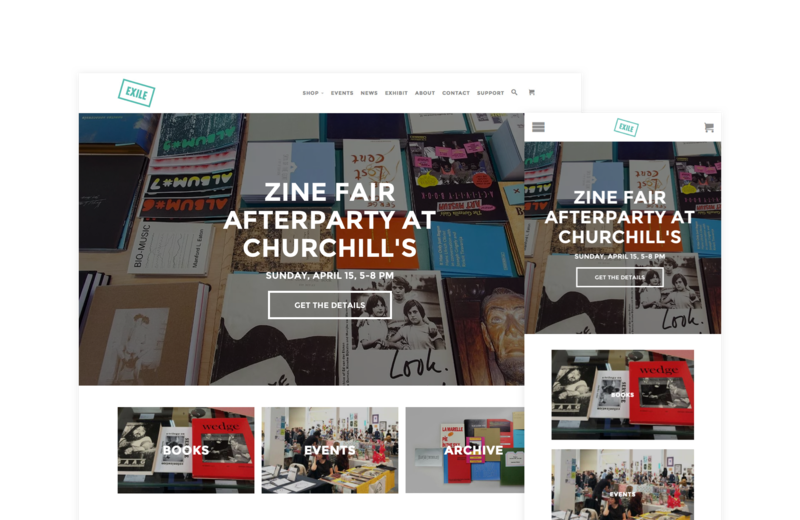 A new experimental artist’s bookstore and publisher need an e-commerce solution. We created an e-commerce solution that could handle both digital and physical sales. Located in Little Haiti, EXILE Books is an experimental artist’s bookstore and project space which recently moved to the Little Haiti neighborhood of Miami. They produce publications and site-specific events such as exhibitions, performances, lectures, fairs, and workshops in order to advance circulation and engagement with artist’s publications. EXILE seeks to establish a pervasive print culture in Miami by creating hubs for independent publishing that represent and serve our diverse community. Launched in September 2014, EXILE Books traversed Miami as a pop-up artist’s bookstore for three years, establishing residency at over 20 locations. Fulano was approached to create a digital presence that would reflect the unique brand of the project and solve a challenging situation with their book sale needs. EXILE need to be able to sell their books both online and from many nomadic locations throughout the city. We worked closely with the EXILE Books team to design and code a theme using the Shopify e-commerce platform. Shopify was able to handle sales both online and from multiple locations all from one inventory. EXILE could use mobile devices to make sales in their nomadic locations and the website for online sales. It all worked together great.